The recent discussion on the relative merits of large and small prints has had me thinking. 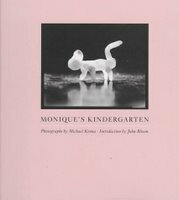 Although I tend to print pretty large, one of my favorite photographic books is Michael Kenna’s wonderful gem, Monique's Kindergarten . I hadn’t held the book in my hands since before my last move three years ago, so I dug through the bookshelves and found the book, just to take another look. It’s a larger book that I remembered (10x10 inches), but the photos are just as I remember them—65 warm-toned prints, printed exactly 4x5 inches. Kenna made the negatives with a 4x5 camera and the prints are, in essence, contact prints complete with the shadow of the film rails. These are small photographs, but they’re not blurry or lacking in detail—they’re exquisitely crisp and full of texture and detail, in that way that large format photographers love. Beyond the print size, though, Kenna’s wonderful small photographs are also photographs in the small—capturing little scenes that match a child’s ability to relate to the world from up close. Many of the scenes captured must be close to the prints in size. There are a lot of things that make this book so incredibly delightful. The photos are beautifully printed and show Kenna at his best, and he’s very good indeed. The quality of the book is outstanding—fabulous reproduction quality, a beautiful binding—everything I’ve come to expect from Nazraeli Press. The book is perfectly sized to be held in your lap, and the paper is just right—it feels good in your hand, and the surface is just shy of glossy, so it doesn’t interfere with viewing. Still, I have lots of books that are as well made as this one, and they don’t enchant in quite the same way. There’s just something about the fusion of the print size, the scene size, the subject matter, and Kenna’s reverent approach to it that makes me think this book is as close to perfection as I’m ever likely to see. So there you go. Sometimes small is just right. I've always loved smaller prints. I rarely print on paper larger than 8x10. I think that smaller prints force you to interact a bit more. >I think that smaller prints force you to interact a bit more. Our book California Earthframes has also not very large photos and this allows a more intimate feeling. Do you mean this by "interact"? Although I've not seen this particular book I know exactly what you mean, Paul; end-to-end perfection of the image process. From subject/scene selection through capture and all the way to presentation (in this case, a book) everything seems harmonious. As photographers we tend to devote most of our attention towards the parts of the process rather than towards the context of how the end product might be presented. We worry about cameras, lenses, printing, and other details. But when the project is completed does it convey a harmonious "rightness" to its viewers? Of course we cannot always consider such a wide-angle view of our work. Often we don't control all of the elements within such a view. Nevertheless, such considerations merit more thought. Very recently I got a first-hand glimpse of this feeling of "rightness" on some of my own work. Several of my images were selected for a special exhibition of architect Frank Gehry's recent works at Toronto's Art Gallery of Ontario. When the AGO revealed that they planned to display two of them at the gargantuan sizes of 12' x 22' I nearly fainted. But after having now seen them (twice) at this size I can say that they're perfectly harmonious within the context of the exhibit. Their size presents a rather immersive visual context to some of Gehry's study models for the buildings depicted. In a different context, however, such huge images would seem garish. So concept, context, and end-to-end details are indeed all very important. how small do you want to go? there's an exquisite book of Andre Kertesz's Hungarian contact prints out there. the book is 5x5 inches, and the photos range from 6x4.5 cm to 6x9 cm. I thought they were the revelations of the Kertesz show in Washington last year (Corcoran or Portrait Gallery? - can't remember). I believe Elton John donated his print of Underwater Swimmer, around 6x4.5, to the show. separately, Judy Fiskin did great work in the "typology" vein in the 70's, all printed about 2.5 inches square. subjects like L.A. apartment buildings rendered in a Becher-like manner. "at this size, they're edible," she said. "you don't just scan them, you take them in all at once." I recommend her work highly, at www.judyfiskin.com. I used to like Kenna when I was a student myself. not so much these days, but I appreciated seeing his work mentioned here.